The Swamp Bay (Magnolia glauca, Linn. )-A splendid tree 50 to 75 feet high, or a shrub of many stems. Bark grey or brown, smooth. Wood soft, pale reddish brown, weak. Buds silky, 1/4 to 3/4 inch long. Leaves persistent in the South, deciduous in the North; smooth, lustrous, bright green, with silvery lining minutely hairy; blades oblong-lanceolate or ovate, 4 to 6 inches long, blunt at apex and base, margin entire, petiole short, stout. Flowers globular, 2 to 3 inches across when spread, creamy white, fragrant, of 9 to 12 broad concave petals. Fruit oval, dark red, smooth, 1 1/2 to 2 inches long; seeds 1/4 inch long, flattened. Preferred _habitat, swamps and pine-barren ponds. Distribution, Florida to Texas and Arkansas; north along Atlantic coast to New York; isolated stations in Suffolk County, Long Island, and near Gloucester, Massachusetts. Uses: Valuable ornamental tree or shrub in American and European gardens. Branches sold for decoration of houses and churches. Cut flowers hawked on city streets. Wood used for broom handles and for small wooden utensils. The swamp bay is remarkable for its range, which extends from Gloucester, Massachusetts, to Florida, and westward to lower Arkansas and the Trinity River in Texas. On the rich " hammocks" elevated above the cypress swamps and pine forests of middle Florida this magnolia is a tree of slender trunk but often 50 to 75 feet high. Leaves, flowers and fruit proclaim it a magnolia. The smooth, silvery linings distinguish the leaves from those of the other evergreen magnolia. The small globular flowers and the smooth, diminutive fruits further identify it. From Bay Biscayne northward along the coast, following the pine barrens and swamp borders, this fugitive species becomes gradually dwarfed and its leaves become deciduous. In New Jersey it is a shrub, vigorous and tropical looking, for the region, but very unlike the sub-tropical representatives of the species. On Long Island there is a station of this bay in Suffolk County. A few remaining plants are known still to exist in a swamp near Gloucester, Massachusetts, the only place north of the latitude of New York which has any recollection of native magnolias growing wild near by. I wandered through that Gloucester swamp, just east of the station named Magnolia, in a vain quest for the remnant of the colony. I was told that the only person who knew where the survivors grew was "the Hermit," who formerly made his living by digging up young plants and selling them. Thrifty garden specimens in Gloucester and other points on Cape Ann came originally out of this swamp. The colony is now practically extinct. Swamp bay flowers are globular and small for a magnoliaonly two or three inches across-but delightfully fragrant. One of the sights on the streets of Philadelphia and New York in May is the street Arab hawking the blossom clusters. A flower with a half-open bud in its whorl of leaves costs ten cents. An absurd custom prevails among these flower venders. They "open" the globular blossoms by springing back the curved petals. The finest flowers are produced by cutting back the tree and letting the suckers grow up thickly around the stump. These bear flowers of unusual size, and clean, handsonic leaves. Professor Gifford recommends the systematic planting of swamp lands in New Jersey to this species of magnolia as a profitable enterprise. He would prune with care, so as to produce the finest leaves and flowers. "The blooming period covers several weeks. Cut flowers and leafy branches command good prices in the markets. Waste land near large cities can be transformed and beautified by this means, and become a source of income to the owners at small outlay. The prunings are salable for house decoration at holiday time. The swamp bay is also called white bay. sweet bay and beaver tree. Beavers used its soft wood for their lodges in earlier times. 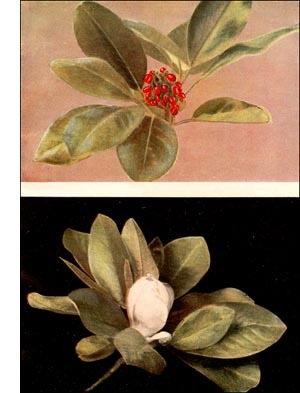 The English call it laurel magnolia. Sweet bay it is called because its foliage is somewhat like that of the bay tree of the Old World, which is commonly grown in tubs by florists and is much used in this country for porch decoration. This is Laurus nobilis, the "laurel" of the ancients. The sweet bay of the swamps grows well in gardens if only the soil is moist. But it is safer and in every way more desirable to get plants of it from nurserymen.